ROCKINGHAM, N.C. – North Carolina Motorsports Hall of Famer Tommy Mauney cruised to victory in the Extreme Outlaw Pro Mod portion of Saturday’s Spring Extreme Drags at Rockingham Dragway while Richfield’s Allen Furr and Riegelwood’s Michael Smith grabbed off the Footbrake and Top ET titles, respectively. Mauney, the Shelby chassis builder who won the 1995 IHRA Pro Mod Championship, saved his best for last, guiding his replica 1968 Chevy Camaro through the eighth mile timers in 3.844 seconds in the final round to turn back the Camaro of Salisbury’s Tony Wilson (3.900). 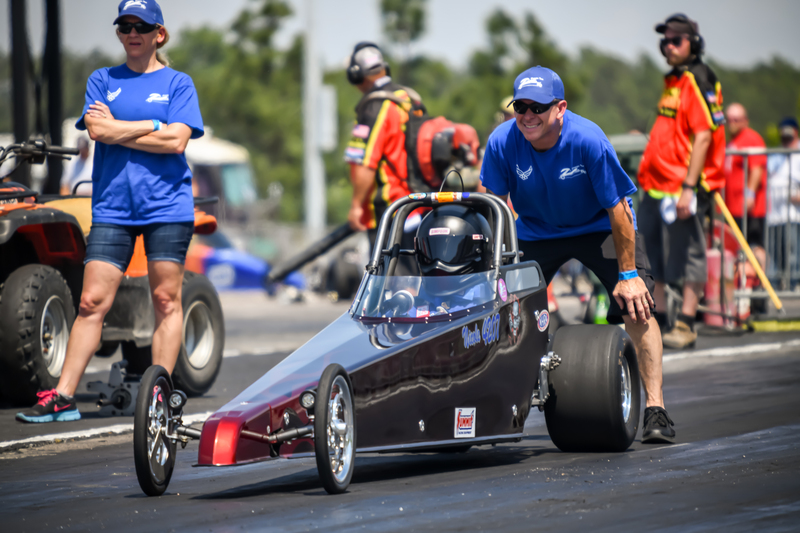 Rockingham’s Terry Rosberg directed the Southern Thunder jet dragster to a finish line speed of 284 miles per hour to highlight the exhibition show and Nicole Zuccarelli of Goldsboro was the Jr. Dragster winner. The event awarded track championship and NHRA Summit Series points in Top ET, Footbrake and Jr. Dragster. 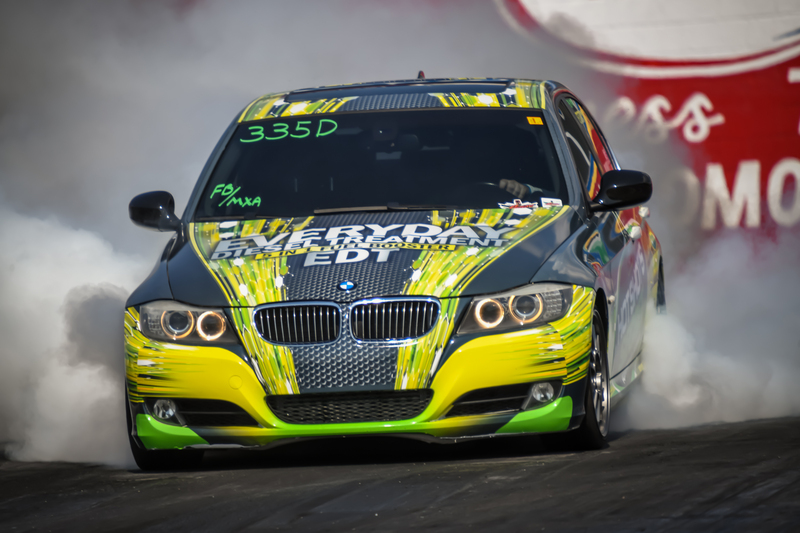 It was a family affair in the MXA Street Car Shootout where Hamlet’s Trey Sikes drove his 2009 BMW 335D to victory over the 2014 Audi driven by his wife, Holly Smith. Qualifying – 1. Tommy Mauney, Shelby, 1968 Chevy Camaro, 3.924, 195.76 mph; 2. Tony Wilson, Salisbury, 1969 Chevy Camaro, 4.246, 168.72 mph; 3. Bubba Turner, Burlington, 1968 Chevy Camaro, 4.299, 167.03 mph; 4. Chuck Hicks, Hickory, 5.218, 96.20 mph. Round 1 – Bubba Turner, Burlington, 1968 Chevy Camaro, .074, 4.089, 179.25 mph, def. Chuck Hicks, Hickory, NA, .140,4.398, 165.21 mph; Tony Wilson, Salisbury, 1969 Chevy Camaro, .140, 4.572, 132.88 mph, def. Carol Long, Moncks Corner, S.C., 1963 Chevy Corvette, .075, 9.469,52.38 mph; Tommy Mauney, Shelby, 1968 Chevy Camaro, bye. Semifinals – Wilson, bye; Mauney, 3.866, 198.17 mph, def. Turner, .054, 4.734, 111.03 mph. FINAL – Tommy Mauney, Shelby, 1968 Chevy Camaro, .049, 3.844, 199.11 mph, def. Tony Wilson, Salisbury, 1968 Chevy Camaro, .042, 3.900, 191.62 mph. 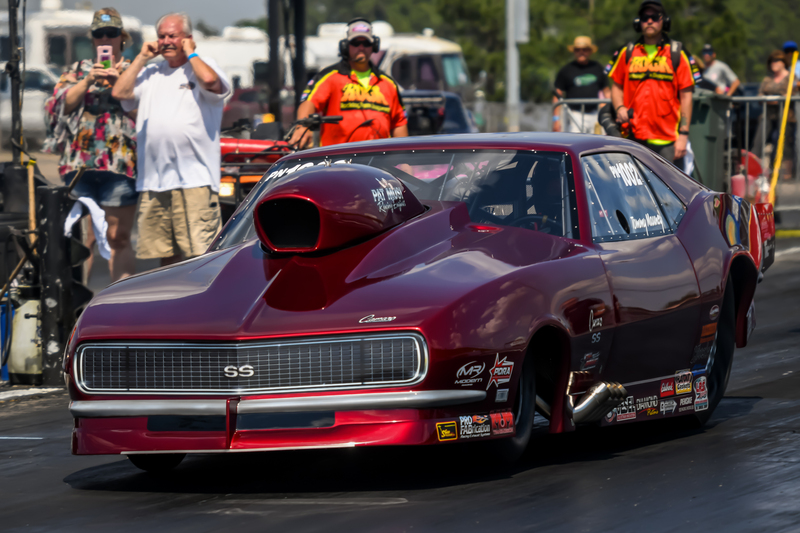 Round 3 – Ron Thompson, Arondale, 1971 Chevy Nova, .036, 6.735 on a 6.690, 103.10 mph, def. Ron Williams, Eagle Springs, .127, 5.983 on a 4.930, 114.32 mph; Mark Soles, Delco, .021, 5.586 on a 5.600, 125.17 mph, def. Wes Keels, Matthews, 1972 Plymouth Barracuda, foul; Howard Brewer, Bennett, 1985 Ford Mustang,.011, 6.546 on a 6.530, 103.63 mph, def. Barry Nall, Eagle Springs, 1968 Plymouth Barracuda, .013, 5.782 breakout on a 5.790, 117.11 mph; Michael Smith, Riegelwood, .016, 5.417 on a 5.400, 127.74 mph, def. Kevin Rollins, Jefferson, S.C., 1973 Plymouth, .014, 6.275 breakout on a 6.280, 105.23 mph; Tony Barker, Stedman, .013, 5.782 on a 5.770, 108.65 mph, def. Lee Desist, Fayetteville, .005, 6.284 on a 6.200, 102.68 mph. Round 4 – Thompson, .015, 6.706 on a 6.690, 103.42 mph, def. Brewer, .018, 6.544 on a 6.530, 103.06 mph; Smith, .009, 5.390 on a 5.400, 126.51 mph, def. Soles, .018, 5.554 breakout on a 5.580, 125.71 mph; Barker, bye. Semifinals – Thompson, .026, 6.701 on a 6.690, 102.12 mph, def. Barker, .043, 5.759 on a 5.730, 118.09 mph; Smith, bye. FINAL – Michael Smith, Riegelwood, .013, 5.389 on a 5.390, 128.31 mph, def. Ron Thompson, Arondale, 1971 Chevy Nova, .003, 6.681 breakout on a 6.690, 102.81 mph. Round 5 – Allen Furr, Richfield,1962 Chevy II, .037, 6.675 on a 6.670, 96.75 mph, def. Mark Soles, Delco, foul; Tim Davis, Fayetteville,.019, 7.897 on a 7.890, 81.28 mph, def. Scott Yates, Gold Hill, 1969 Ford Mustang, .078, 6.369 breakout on a 6.370, 108.00 mph; Hunter Edmundson, Pikeville, bye. Semifinals – Edmundson, .020, 6.795 on a 6.780, 96.01 mph, def. Davis, .019, 7.875 breakout on a 7.890, 86.32 mph; Furr, bye. FINAL – Allen Furr, Richfield, 1962 Chevy II, .062, 6.689 on a 6.670, 95.60 mph, def. Hunter Edmundson, Pikeville, .051, 6.776 breakout on a 6.780, 99.55 mph. Round Robin 1 – Budd Trammell II, Aynor, S.C., .110, 8.878 on an 8.900, 72.83 mph, def. Nicole Zuccarelli, Goldsboro, .029, 7.856 breakout on a 7.900, 77.08 mph; Marissa Bickford, Concord, .014, 7.954 on a 7.900, 81.69 mph, def. Nolan Callahan, Fayetteville, foul. Round Robin 2 – Zuccarelli, .007, 7.979 on a 7.900, 71.65 mph, def. Trammell, .131, 8.904 on an 8.900, 71.53 mph; Bickford, .003, 7.992 on a 7.970, 81.23 mph, Callahan, no time. FINAL – Nicole Zuccarelli, Goldsboro, .033, 7.839 on a 7.900, 82.72 mph, def. Marissa Bickford, Concord, foul. Round 3 – Michael Broadway, Rockingham, 2007 Ford Mustang, .175, 13.938 on a 13.950, 100.63 mph, def. Chris Johnson, Fayetteville, .134, 15.144 breakout on a 15.380, 77.01 mph; Holly Smith, Hamlet, 2014 Audi, .094, 14.657 on a 14.640, 88.93 mph, def. Jeremy Ritter, Robbins, 1984 Ford Mustang, .113, 11.971 on an 11.920, 113.91 mph; Trey Sikes, Hamlet, 2009 BMW 335D, bye. Semifinals – Sikes, .113, 12.520 on a 12.230, 93.81 mph, def. Broadway, .385, 14.013 on a 13.950, 100.52 mph; Smith, bye.